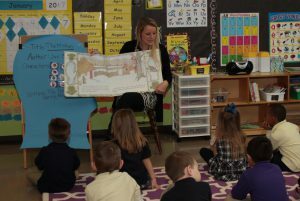 The kindergarten curriculum and its content areas focus on developing the whole child – spiritual, physical, emotional, social, and intellectual. An integrated curriculum incorporates academic subject areas and basic skills areas into learning experiences that are cognitively and socially meaningful, as well as developmentally appropriate. Integration strengthens learning because the kindergartner can build on previous experiences and explore more deeply. Integration of curriculum also provides for repetition of instruction, which allows for multiple opportunities to explore and investigate new information in different settings and with different materials. Since children learn in many ways, we use strategies that allow children to develop and employ a variety of their multiple intelligences and learning styles. The program recognizes the importance of a stimulating environment that offers children a variety of experiences and materials to aid the child in developing to his or her fullest potential. Children are given many opportunities to grow in self-esteem and confidence in small groups, large groups, and individually. Above all, we integrate our Christian faith into all aspects of our curriculum. 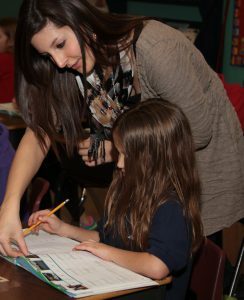 First grade is a challenging and rewarding time for young children as well as their families and teachers. 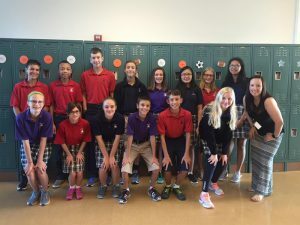 Students come to the class with varying degrees of experience, ability, and emotional maturity. Therefore, it is necessary to provide a flexible program which ensures the maximum growth for each child. Our program is based on the premise that children learn by experiencing the world around them. These experiences provide the foundation upon which skills are built. God has made each child special, with his/her own time schedule for development. It is the task of the classroom teacher and the school to provide an environment in which this natural development is enhanced and encourage. It is our goal in first grade to make school a safe, enriching, interesting, and joy-filled place of spiritual, emotional, social, physical, and cognitive growth, in a developmentally appropriate atmosphere of Christian love. Second graders come to school familiar with many of the routines and expectations of school. They have the academic foundations established in kindergarten and first grade are more relaxed and able to build on those foundations. Because students have varying degrees of ability and maturity, our program’s flexibility seeks to meet the needs of each child to help him or her develop and use all the gifts and talents God has given. Children learn and develop best when they experience the world around them and are actively involved in the learning process. Our program is designed to use developmentally appropriate activities that will enhance their learning. We believe that teachers and parents form a partnership in carrying out the responsibility of nurturing and educating children spiritually, physically, cognitively, socially, and emotionally. Together we want to teach children in an atmosphere of Christian love so that they will mature in their faith in Jesus Christ, and become confident in their salvation as well as developing their academic skills. Third through fifth graders, like all of us, need lots of praise and encouragement. The classroom experience must be structured in such a way that success is inevitable. The reality is, though, we will make mistakes. This can be a positive experience when we help students realize this too is growth. Children learn and develop best when they experience the world around them and are actively involved in the learning process. Our program is designed to use developmentally appropriate activities that will enhance their learning. In third grade students begin to make the shift toward independent learning. With the mastery of reading and the introduction of text books, students make the developmental shift from learning to read to reading to learn. Accordingly, in grades 3 through 5, our math, reading and science curriculum is departmentalized to allow our master teachers to instruct students in their area of expertise. Unlike our middle school, students in 3 through 5 remain in their homeroom and the teachers rotate. The remaining subject areas (social studies, religion, grammar/spelling, art) are taught by the grade level homeroom teacher. Spanish, music, technology and P.E. are taught by auxiliary Child of God faculty. In the end, school success is not measured by how well the teacher teaches a lesson or how well the student masters a lesson. Rather, student success is inevitable when home and school work together. Parents, teachers, and students must work together if the student is to develop spiritually, physically, socially, emotionally and cognitively. When we work together we create an environment that has its root in Christian love. It is our desire to prepare students for high school and beyond as productive Christian citizens in an ever-changing world. In order to achieve this goal, Child of God has chosen to departmentalize the middle school grades. Students will move about during the day to teachers who have specialized areas of study. The homeroom teacher will be the main teacher of each grade level. This will provide the student and parent with one individual who knows the student best and will facilitate parent-teacher communication. This communication is essential for the continued development of these young people.